Well, we can’t be sure plants are capable of love… At the very least, aquarium plants need light (fish do, too!). When you’re looking to light your planted tank, full spectrum LED lights are a great option. Plants thrive when they’re photosynthesizing multiple wavelengths of light. And that’s what a full spectrum LED light can give them: all the wavelengths plants need to grow. Of course, having the right variety of wavelengths isn’t enough to grow plants well. Plants need adequate amounts of light, too. If your light isn’t strong enough, your plants can’t make enough energy. If that happens, they won’t be as healthy or as vibrant as they could be. 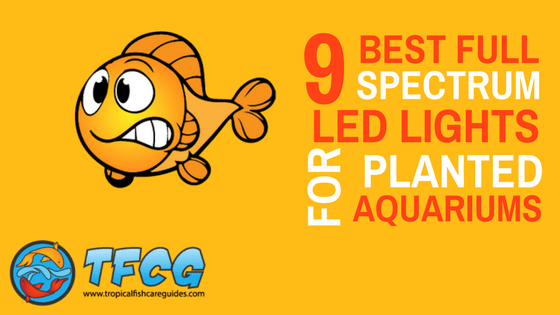 Now, the nine full spectrum LED lights on this list are some of the best lights available for freshwater planted aquariums. The prices vary, the features vary, and the strength and sizes vary–but each fixture on this list can handle the job it was built for. Each tank has unique needs, so make sure you’re picking the right light for your tank (i.e. if you’re growing a lot of high light plants, don’t pick one of the more dim fixtures on this list)! Consider what you and your tank need from an LED light source before deciding on a fixture. The Fluval Aqua Fresh & Plant 2.0 LED is designed to let you put the fixture right on top of the tank (even if you don’t have a canopy). It has water protection, as well as light lenses that allow for 120-degree dispersion. This design reduces the amount of light lost in the space between the fixture itself and the water in your aquarium. This fixture features a lot of blue and red light for “optimal” plant growth. It’s a bright light but includes a dimming switch so you’ll have control over the amount of light entering the tank. The Fresh & Plant 2.0 LED has sturdy extendable brackets to accommodate the length of your tank (up to about 34”). The fixture has five LED colors to optimize plant growth. This full spectrum is activated when in the “white light’ setting. The fixture also has a low-light “blue light” setting. 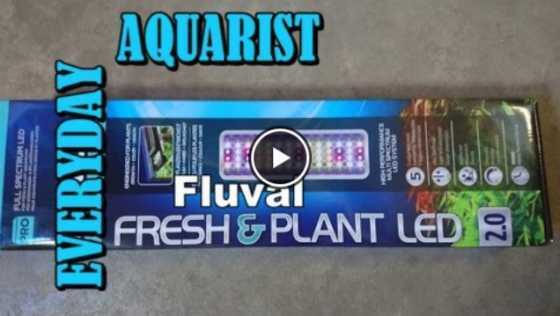 Check out this Fluval Fresh and Plant 2.0 LED overview/review from Youtuber Everyday Aquarist. In the video, he talks about the light features and parameters, he discusses the boxing, the packaging, and the settings on the light. He also does a quick demonstration of how to use the light’s functions. This fixture is at the upper end of the available LED price range, but it’s a well-made piece of equipment. If your tank needs a lot of light, this fixture could be the right move. If you’d rather hear the official Fluval overview, the company made a Youtube video on their Fresh and Plant 2.0 LED fixture. The Current USA Satellite Freshwater LED+ Light features a lot of the “cool” weather simulation options: dawn, dusk, stormy, etc. It sits right in the middle of the price range when compared to similarly sized full spectrum lights. The fixture comes with a remote to control the lighting in your tank. You’ll need this since there’s no timer for this product. That means that, even though you have light settings mimicking sunrise, sunsets, and other time-specific light intensities, there’s no way to set up the fixture to cycle through these lights for a 12 or 24 hour period. You can create your own custom colors with the remote, which is another neat feature, but not necessarily useful for growing plants. The Satellite Freshwater LED+ has a sleek, unobtrusive housing design. The LEDs are covered with a casing that will give the light extra protection against water splashes. When appropriately sized for the tank, customers have reported successful medium light plant growth. 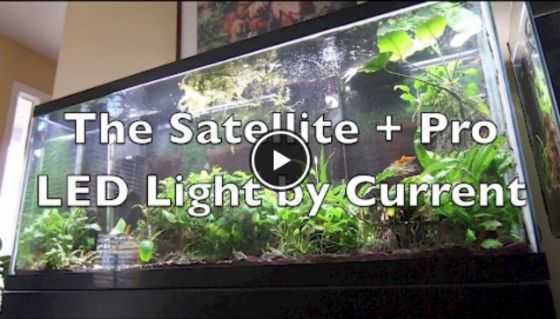 YouTuber Cichlid Fanatic walks you through the different Satellite LED+ light settings and how they look on his tank–he is happy with his purchase. But, as his name suggests, he’s a fish fan. Growing plants is not a priority for him with this light. 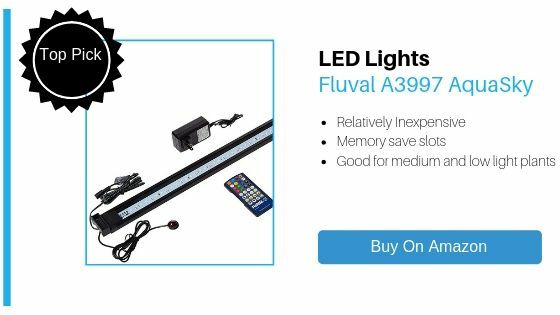 The Fluval AquaSky LED is one of the less expensive LED fixtures on this list. The AquaSky is suitable for growing low light and medium light freshwater plants. The fixture is lightweight with a slim build. This fixture is waterproof to a certain degree. It can handle regular splashing (but don’t go dunking it in your tank!). It features extendable brackets that can accommodate lengths a full foot longer than the light itself. This fixture comes with a remote, and the remote comes with a number of presets. It has some of the popular weather effects, like cloud cover and lightning storm. It also features sunrise, sunset, and moonlight settings, as well as others. For review videos, we’re going back to YouTuber Everyday Aquarist. 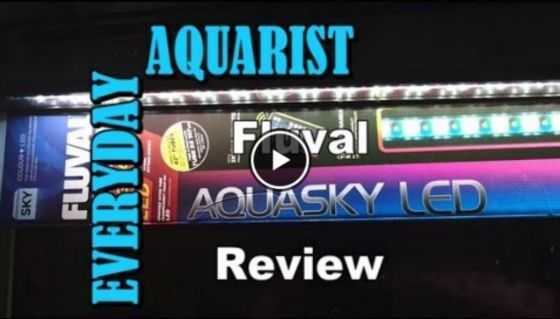 His Fluval AquaSky LED review has some good information on what to expect and shows the light in action on his own tank. The infrared remote lets you adjust the colors on your fixture, so you can customize your own tank colors. The remote also has four memory slots. You can use those slots to save custom colors and recall them later. A timer is not included in this unit, but for another $20 you could grab a Fluval digital LED lamp timer. This may not allow you to cycle through weather settings, but it can give you peace of mind when you have busy days where you can’t monitor your tank closely. 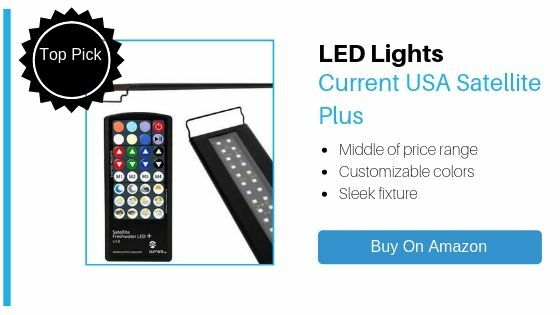 The Current USA Satellite Plus Pro LED is a thin fixture intended for use in freshwater aquariums. This light is expensive compared to other available options. This fixture has moonlight settings, sunrise settings, and storm and cloud effect settings. These settings are pre-programmed as specific buttons on the remote. The remote also has four pre-loaded color spectrums which are optimized for certain tanks. You can design custom colors and save them in one of two memory slots available on the remote. The Satellite Plus Pro LED fixture features a 24 hour on/off timer cycle. You get full control over the start time and end time. This lets you optimize the light period for your plants and for your tank viewing pleasure. YouTuber Pecktec has put together an informative and entertaining unboxing and setup video, so you can hear more about the fixture and actually see the Satellite Plus Pro LED in action. This fixture also features a ramp up and dim down feature. The first and last 15 minutes of your light cycle gradually increase and decrease (respectively) in brightness over a 15 minute period. The intensity of the lights for both daylight and moonlight are adjustable. The fixture features a 120-degree reflector for more even light spreading in your tank. Some users have complained that “resuming” the light cycle will sometimes make the timer default to full brightness, before adjusting to the appropriate light for the appropriate time. 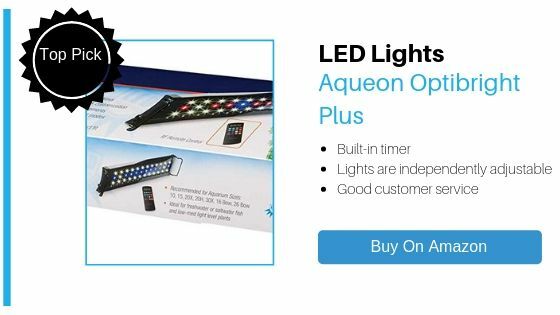 While the original Optibright LED fixture had some issues, Aqueon made a worthwhile product with the Aqueon Optibright Plus LED lighting system. The Optibright Plus is a good deal–it’s less expensive than some similarly-sized, similarly-featured models. The OptiBright Plus includes a 24-hour timer feature. The timer features 30-minute ramp up and dim down times on either end of the cycle. You can control the intensity of the lights using the remote. 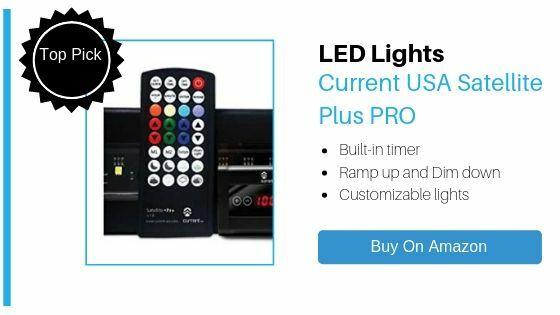 This control extends to independently adjusting the white, blue, and RGB LED lights. The individual control over the different LEDs also extends to the timer, so it’s possible to have different on/off times for different colored lights. The Optibright fixture is thin and black. It has extendable brackets, giving you a little bit of wiggle room to accommodate the length of your aquarium. This light is appropriate for low to medium light plants. If your planted tank needs a lot of light, you’ll likely have to double down on this fixture or find another fixture to supplement the light. Customers have been happy with this light. Some customers reported the light failing, but Aqueon has come through for those customers and replaced the fixtures with one that isn’t faulty. 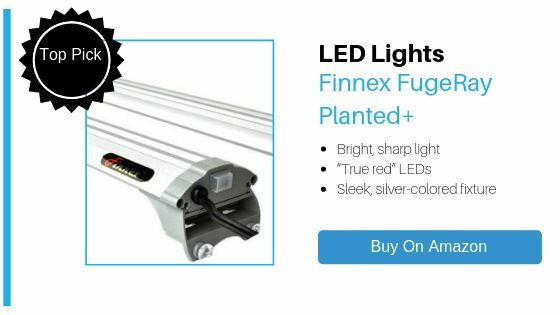 The Finnex FugeRay Planted Plus Aquarium LED is another sleek LED fixture. Finnex opted for the silver colored housing rather than the more common black housing. The housing is slim and will sit unobtrusively on the top of your tank. The fixture comes with a “unique leg system” designed to accommodate various tank sizes. There are no extendable brackets on this unit, so keep that in mind when you’re sizing the light for your tank. The fixture comes in six sizes, the smallest being 12 inches and the largest being 4 feet. The fixture provides plenty of light for low and medium level plants. To successfully grow heavy vegetation in a bigger tank, you’ll likely need a supplementary light source. The FugeRay offers “true red” 660nm LEDs, which the company claims are best for photosynthesis. Some customers have complained about issues with flickering lights (one handy customer blames this on the power supply, not the bulb quality). Other customers have had no issues with the unit. YouTuber PeckTec has a video where he compares his FugeRay Planted+ fixture with other lights he has set up on other tanks around his house. He’s impressed by the brightness, and he should have a “one year review” up in a few months to weigh in on the light after spending a year with it in action. Another great light from Finnex is the Planted Plus. 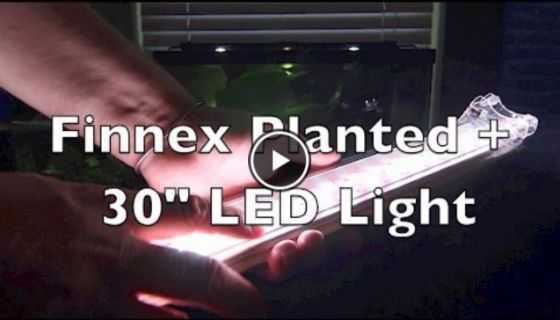 If your looking for another option from Finnex check out our detailed review of The Finnex Planted Plus. The Beamswork EA Timer FSPEC LED fixture comes in a thin, black, aluminum housing. The light features the common extendable brackets so you can adjust the fixture length to fit your tank. 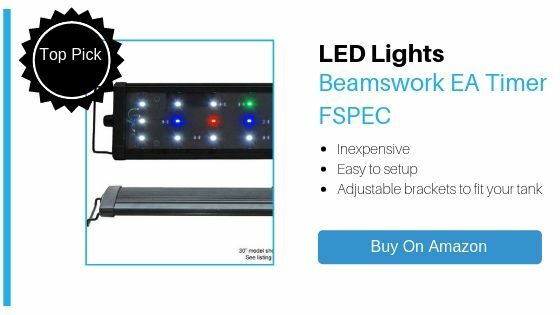 The Beamswork FSPEC gives a soft white light on its standard setting. It isn’t the brightest light on the market so it’s probably best suited for low light plants. It features a “night mode” which is just a blue light setting. Beyond switching between white light and blue light, the colors on this full spectrum light can’t be controlled. 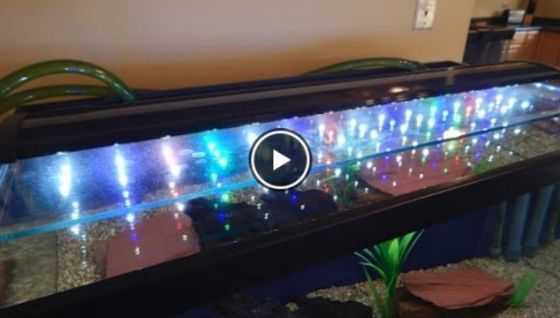 YouTuber JDO Fishtank has a video showcasing his Beamswork EA FSPEC LED. The visual comparison starts around the 8:30 mark, where he shows his tank’s old lights and then switches to his new Beamswork. Prior to that, he spends time on Amazon comparing the options and talking about why he went with this particular light over other available fixtures (could be helpful if you’re in the same boat!). It’s one of the most inexpensive full-spectrum LED lights on the market. It doesn’t come with a remote since it only has two settings. And while it is pre-wired to work with a timer, the timer is sold separately. If you’re looking to grow some low light plants, and you want an inexpensive fixture with a soft white light, this is a great option. 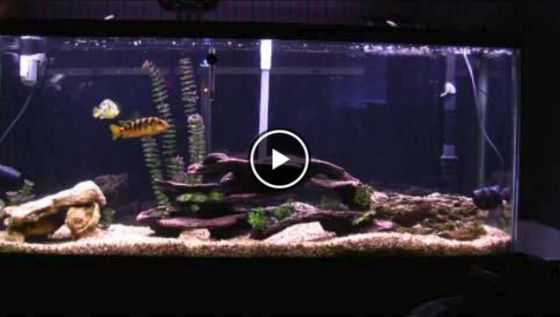 YouTuber JDO Fishtank has a video showcasing his on Beamswork EA FSPEC LED. The visual comparison starts around the 8:30 mark, where he shows his tank’s old lights and then switches to his new Beamswork. Prior to that, he spends time on Amazon comparing the options and talking about why he went with this particular light over other available fixtures (could be helpful if you’re in the same boat!). 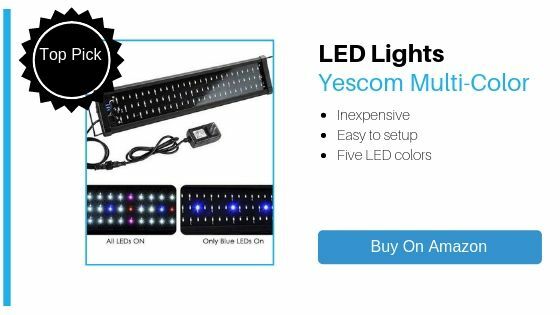 The Yescom Multi-color freshwater LED lamp is an inexpensive fixture. It’s a thin fixture, featuring the common black housing made of aluminum. The Yescom fixture features 5 colors: Red, green, blue, white, and pink. It only has two color modes: white light (all LEDs on) and blue light (just blue LEDs on). The unit has extendable brackets to accommodate tanks that are a little bigger than the light itself. For reference, the manufacturer lists their 48” fixture as the appropriate length for a 45”-50” freshwater tank (the light itself is 45.5” long). The manufacturer also recommends using two fixtures on the same tank for “sufficient light and better sightseeing.” If you have a shallow tank or very low light plants, this LED could be an inexpensive way to give your tank the light it needs. If you have a tall tank or high light demand, one of these units alone likely won’t do the trick. The unit doesn’t have a remote since it doesn’t have any of the “bells and whistles” lighting features. It doesn’t come with a timer but should work just fine with a standard wall timer. Most customers are very happy with the way the light looks. A few customers have reported issues with the light fizzling out after a few months. The COODIA LED fixture might make you a little nervous–it includes a number of features but a low price tag. You gotta’ be missing something, right? Turns out COODIA makes a solid fixture and offers it at a great price. For smaller tanks with medium to low-light plants, this full spectrum fixture is a good pick up. This LED fixture features a number of colors to choose from. You can access the color options via the remote control that comes with the unit. The remote also has brightening and dimming options. If you’re looking into this light for purely aesthetic reasons, you’ll likely get a kick out of the color transition options offered through the remote. Options like “fade” and “smooth” will engage the color cycling feature. These transition options adjust the speed of the cycle, and also offer novel effects like “strobe.” These features aren’t the most useful when growing plants in your tank, but they are a fun way to showcase your aquarium. The fixture has a thin black aluminum housing, as well as extendable brackets. It’s hard to do better than this price. It’s almost half the price of similar products from bigger name brands.